Horror-Comedy entertainer film 'Raa Raa' is all set for release on 23rd February. Srikanth, Naziya, Seetha Narayana played the main lead roles. The film is being made under Vizi Charish Vision banner with Sreemithra Chowdary as presenter. Vizi Charish units handled the camera department. The film has completed all formalities and is all set for release on 23rd February. A Pre-release event was held yesterday and Natural Star Nani and Tharun graced this event as chief guest. 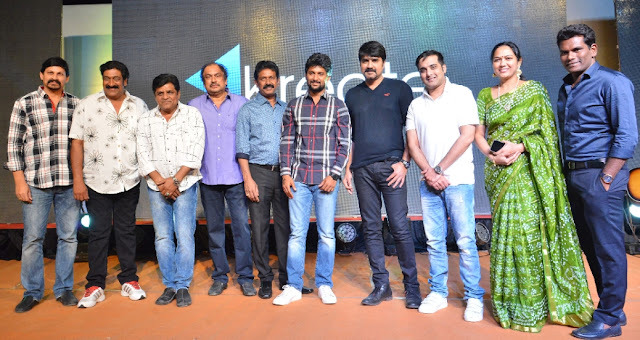 Hero Srikanth's website, mobile App and 'Raa Raa' Theatrical Trailer was launched on this occasion. Speaking on this occasion, Hero Nani said "I respect Hero Srikanth garu, I worked as a Asst.director for his film 'Radha Gopalam'. I am happy to launch his Website and Mobile App. 'Raa Raa' is a Horror comedy film and I wish for grand success. Srikanth is as young as he was at 'Radha Gopalam' time. I wish him to do more films and stay young. All the best to whole unit". Hero Tharun said "Srikanth, Chowdary and Vijay are close friends to me. This Pre-release function looks like a family function to me. Srikanth did 125 films but he never did a Horror genre film. Now, he is doing this horror flick and I wish for movie success". Hero Srikanth said "Raa Raa is my first Horror flick. I liked the subject. Though it is a Horror comedy film, it is a different subject film and we enjoyed doing it. I wish this film will be hit film in my career. Producers Vijay and Chowdary were very supportive. Rap Rock Shakeel composed music for this film and will be doing music for my next film too. I Thank Nani and Tarun for gracing this occasion. Raa Raa film is releasing on 23rd February". Producers said "Srikanth and we are friends from 24 years. After a long time, we are doing film together. It is horror comedy film but a new genre film. Story and concept will be very different and fresh. This film is releasing on 23rd February".